Offering more flexibility, options on futures allow investors to better customize their risk management strategies. Chicago-based CME Group (NASDAQ: CME), one of the world’s paramount exchange operators, has published its July Options Review which showed a mixed performance across the group’s overall business, according to a CME statement. During July 2016, total FX options averaged 61,988 contracts per day, which represented a drop of -11.0 percent YoY from 69,620 contracts per day in July 2015. Across a monthly interval, the latest figures also reported a 12.3 percent decrease from 79,268 contracts per day in July 2015. In addition, CME Group’s average daily Equity Index options volumes also pointed lower in July 2016, coming in at 586,914 contracts for the month, down by -17.9 percent from 715,441 in the prior month. However, the figure reflects a slight improvement on the yearly basis, up nearly 1.0 percent compared to 585,419 in the same period of last year. 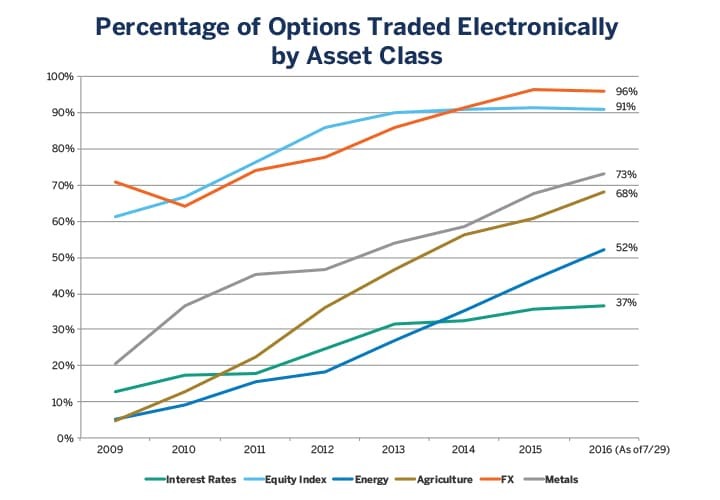 In terms of metals options, the holding company for CBOT, NYMEX, and COMEX exchanges averaged 37,287 contracts per day last month, which is a drop of -17.32 percent when compared to July last year’s figure of 45,102. Relative to the previous month, CME saw an ADV decrease of -18.2 percent MoM from 45,632 contracts in June 2016. Earlier in July, Finance Magnates reported on the CME Group when the company announced its Q2 financial results which managed to outperform the metrics of Q2 2015. During the second quarter the CME Group has managed to increase its revenue by 11 per cent when compared to last year, marking $906 million.